Many thanks for your excellent website and efficient delivery of my aerial. On fitting a set top box I found that the loft aerial was inadequate. I bought a "high gain wide band" aerial locally with many elements which proved to be inadequate, even for terrestrial !!! I discarded it and reverted to the old aerial. I then read your website data and decided first of all to replace the downlead and wall socket( made out of fibre-board). This produced a significant improvement, but still inadequate, particularly on one MUX. I bought your 18A Yagi and this completed the transformation to successful reception. I am, for the record , 26 miles from Crystal Palace with a fair line of sight. Your practical notes taught me a lot and I commend them to anyone addressing a reception problem. Amazing .... thanks to all the fantastic advice on your website, I can now get Freeview at home, with almost full strength on all MUXES ! In fact, I can even pick up CH5 on terrestrial TV which I could never do before. I am very impressed with the Yagi18A grouped aerial, it works wonders compared with a wideband aerial from Argos ! Incidentally, I am additionally picking up some channels from the Mendip transmitter - which I believe is not an group A transmitter, and is completely in the opposite direction, weird ! 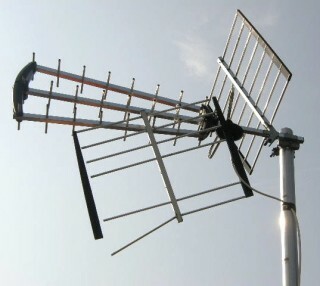 Have just purchased one of your Yagi 18B aerials as our old one (a Yagi 12 ? ) 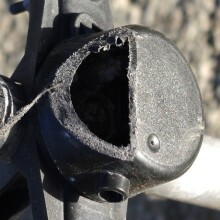 , was 25 yrs old and bits falling off. Wanted reception of Black Hill whilst we are down behind a very large rise in Lanark. Used your cable replacing ordinary brown sheath. 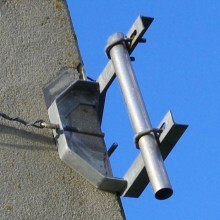 Aerial mounted about 1.5 metres above the chimney. Results approx 2db improvement over digital channels 41 to 51 and nearer 15db at 55 (Mux5); nothing at Mux6, as expected (pre DSO - Jun 2011 - Black Hill was an E group). No actual field strength figures available ( no meter ) but analogue signal fair and better than it ever was with little noise and echoes. Have just installed the new 18 element Yagi group A aerial purchased from you. Reception is excellent but may not be just the aerial as I also ran new cable from the aerial to my Sky box in the lounge and then back up into the loft to my distribution amplifier. (Sky is piggy backed onto the signal via RF2 output to allow me to watch Sky on analogue TVs elsewhere in the house.) My existing aerial was an 8 element Yagi but I was suffering from picture drop out (what you call the 'digital cliff') depending on weather conditions, although Mux 1 was always received - I live in SW Surrey and officially we won't get digital TV until 2012! The area is very hilly and, despite living on top of a hill, it's difficult to get clear sight of the nearest transmitters at Guildford and Midhurst or the local repeater. Our old aerials were pointing at Crystal Palace (about 55km distance) so following the advice on your site I decided to upgrade the aerial with a higher gain group A rather than a wideband as I originally intended. I calculated the bearing of Crystal Palace using Grid Coordinates to set alignment of the aerials. Hope this information is useful and thank you for a very informative and helpful site. The old aerial worked well on analogue signals but, with our 'digital' TVs, programs disappeared and reappeared. I thought it was work on the transmitter at first but then twigged that it depended on the weather. Hopefully the new aerial and higher quality directly connected cabling (no wall plates) will reduce the incidence of the problem, certainly no problems so far despite very heavy rain this week, the South East Monsoon of early June has arrived. This would have caused problems with the old aerial. so I swapped it for a Yagi18A and there was a big difference, the signal strength jumped from 38% up to 100%. Far better. Just thought you'd like a report on the aerial I brought from you just over a week ago. The aerial in question was a Yagi18A. I reported at the time that I lived in a weak signal area and to confound the issue I had a very large tree some hundred yards away blocking the signal path. The main problem I had was that I could not receive ITV channels and a few others besides in the summer when the leaves came on the trees. Analogue was very poor too. Fitting the Yagi in the same position as the old wideband aerial did increase the signal strength and certainly improved the analogue signal but still no ITV channels although I did get a couple of the other channels that were missing. Having moved the aerial pole etc. to a new position in my garden I am happy to report that I can now receive all the channels I once had. Analogue is almost as good as digital. Signal strength is off the clock. I certainly like the look and build quality of this aerial and would recommend it to anyone living in the Rowridge transmitter area if they are having problems as I did. One final note. It's been quite windy down here in the south the last few days and I do have to say that the Yagi creates less movement than my old aerial did on top of it's twenty foot pole. In all I give the Yagi 18A top marks in all categories. Performance: very good. Signal strength has increased by 50% over old 'Contract' aerial although height has been increased by 3 feet. I've just fitted the second aerial I've bought from you and am again very pleased with the results. With Crystal Palace as our transmitter we have always had trouble receiving anything. Previously I bought and fitted an XB16A from you, this to our own property after unsuccessfully trying a succession of Maplin & other DIY store wideband aerials. I've just fitted a Yagi18A from you to our elderly neighbours house which is a touch higher than us and where cost was an issue for them (why they didn't go for the XB16A). This was to replace a home-built Yagi which was OK but suffered major interference from lawnmowers etc. On the digital side Freeview is perfect on all channels. Analogue BBC1,2,ITV & C4 all excellent but 5 is not really watchable (no matter as its on Freeview anyway). As the signal is going to be split to 3 TVs I've a single 20dB masthead amp. I adjusted the aerial using a Labgear "DVB-T Finder" *, got the max number of LEDs lit on the meter and left it at that. Guess I could mess around to get 5 better on analogue but can't see the point. I would recommend you and will be using you again. Many thanks. * Purchase of a signal strength meter is unnecessary for most people (other then boaters or caravanners), particularly whilst the analogue channels are still being transmitted. I`d normally recommend tuning in your analogue channels then peaking up the alignment on the weakest of them. 95 times out of 100 that`s also peak reception on the digital as well. Thanks for a very prompt and efficient service recently. I bought a Yagi18B aerial and variable gain 4 way mast head amplifier together with a fixing kit recently. The aerial and parts were all of good quality and I found it easy to install. I would like to say how useful the information on the website was in helping me to choose the right equipment. I am tuned into Sutton Coldfield but the tall buildings and electronics of Birmingham City Centre are directly between us and the transmitter, so reception has been a bit difficult even though we are only 10 miles away. The new aerial produces a signal with 100% quality and 70% strength (with gain turned up) as measured on the Humax 9300T, much better than the old one [a 12 element Yagi type] which is actually in a better position. Anyway many thanks for your efforts on the website as it made the choice much easier. We live West of the I of Wight and originally had a short wideband type aerial and the signal was poor with analogue, though digital wasn`t too bad. Swapped it for a Yagi18A and both digital and analogue are now good. wasn`t up to the job. Having swapped to a Yagi18A things are much better. one thing we did notice was that the aerial actually works better, as it points through the trees, if it`s mounted three foot lower ! I live at the bottom of a valley so reception is not great. Before getting a digital TV I wanted to maximise my analogue picture quality which would normally do the same for the digital signal. I was sold a Vision V10-481 (a model of XB10WB) but the picture was still far from perfect. Swapping to the Yagi18B gave us the best picture we`ve ever had, I was very pleased, but that was only on 1 to 4 because Channel 5 was no better for some reason ! I don`t really understand that either, possibly co-channel interference ? I have just fitted your Yagi18A which replaced a smaller wideband aerial and a booster. I now get a better signal, with no booster, showing 80% on the TV's built in signal strength bar graph (previously about 75). Around here (PO7 area) there is a lot of talk of "oh you need a digital aerial mate" which the info on your site confirmed is a load of B****ks (don`t sit on the fence old son, tell us what you really think). A decent band A for £25 is all you need. For info I also used your (good quality) cable and didn't fit an intermediate wall plate (which I would have done before reading your info). I also took cable through reflector and looped down to the pole (why don`t the connector blocks face the other way ?! - good point). Great service, loads of excellent info and advice - will def use again and recommend. We recently installed a new IDTV which immediately showed symptoms of poor reception with frequent picture jumps / pixellation and interruptions to sound. The PVR we had been using with the old TV and the set top box in the kitchen working off the same aerial were fine. After a bit of discussion on MB21's RX-Chat newsgroup I learned that some integrated TV's produce a lot of spurious radiation which can be picked up by the aerial connection leads in the room which can affect reception. This seemed to be the case as playing around with the flyleads produced variations in the signal strength reading on the TV. Having previously thoroughly perused ATV's extremely informative website, I knew just where to go to obtain some decent double screened flyleads and a screened wall plate to try and eliminate the problem. I thought I may as well upgrade the whole system at the same time and added a Yagi 18A to my order to replace the old cheap Maxview Yagi 18 wideband aerial from a big DIY chain, put up in a hurry several years ago. The goods arrived very quickly and I straight away installed the wall plate and flyleads which had an immediate beneficial effect with only very occasional reception hiccups noticed. The terrible weather finally relented today and I got busy on the roof installing the new Yagi 18A with some double screened CoAx I just happened to have lying around ! I didn't route the cable as per instruction leaflet with about a metre of cable spanning the gap between the aerial reflector and the mast. Instead I ran it forward from the terminal box and taped it to the boom. I'm not convinced the suggested method makes any difference to the signal (I couldn`t find any difference when I tested this) and it just looks awful and wrong. Coming back to the website for this report I see from the photos that is the way you do it at ATV anyway so I'm in good company. The only part of the system I couldn't replace was the three metres or so of coax immovably embedded in the cavity wall. It is older coax and appears to be relatively high quality having dense copper outer braiding so hopefully it won't degrade the rest of the system noticeably. After completing the installation the TV shows an average increase across all the muxs of about 10% signal strength, the PVR about 15% but the kitchen digibox (fed from transformer coupled type passive splitter in loft) only 2-3%. However the digibox signal indication seems to saturate at 86% and doesn't go higher even if you plug in a preamplifier. What these figures relate to in dBuV, I haven't a clue. Suffice to say it seems to be a significant and very worthwhile improvement as I would have expected with a group A over a wideband. The extra screening and the balun in the aerial seem to be doing their job along with the improved signal as the TV has been on all afternoon and evening and there has not been a single reception glitch noticed. Evidently a big improvement in carrier to noise ratio. I knew that it would be a good move dealing with ATV as anyone who lavishes so much time and effort on a website so full of knowledge and experience and so useful to layman and pro alike obviously cares about their customers, not a thing you can take for granted these days. Many thanks Justin, I will definitely call again if and when I need more aerial gear. Our bungalow is approx 80m above sea level and located about 18 miles to the east of Crystal Palace. The previous aerial (an XB10 wideband ?) was purchased about 15 years ago. The aerial is connected to a masthead amp in the loft with four outputs. The problem with the old aerial was pixellation with sound breakup, & on some occasions the total loss of reception of one of the muxs. Also, I have one of the M/H amps o/p's feeding a Labgear Quadplexer & this in turn feeds a triplexer output plate in the kitchen. The TV in the kitchen would report "NO SIGNAL" on Chan 5 & QVC, the only way that I could get those chans was to insert an amp between the triplexer plate & the TV, turning up the gain on the M/H amp in the loft didn`t help. 1. Do not need the amp for the kitchen TV - all chans work fine even in very heavy rain. 3. Analogue. It works but do not bother with it. Contrary to everything I have read, the digital picture is better especially when showing material shot in HD. Digital does have a better picture unless you have a perfect analogue signal (which I concede most people do not have) in which case analogue is better, though HD is indisputably the best picture of all. 4. I`m quite happy with the aerials build quality. I particularly like the H/D wingnut type bolts on the boom connector, saddle & mast clamp & also the tilt adjustment on the mast clamp. I am a lot happier now with the reduced weight and wind loading of the Yagi over the XB10. I had originally been persuaded to buy a Labgear 18 element Log Periodic with a built in 4 way amplifier to feed my four TVs. Unfortunately the digital signal was poor on the ITV channels, it was better on the others but still imperfect. whereas I now have 100% signal quality on all channels. Very pleased. B n`Q aerial I ever bought ! The only reason I took time out to send this email is because I was VERY impressed with your service and quality of your goods, a big thankyou. B&Q special. Not particularly cheap if I recall. It was very flimsy, and supplied with an indoor roof space mounting kit, AND I mounted to the fascia board outside (slapped wrists). It lasted about five years with barely acceptable performance, with VERY poor reception for the last year, prompting replacement. I eventually purchased one of your Yagi18B aerials with your mounting kit last week, and fitted it today. The kit is great (everything you need) and the aerial was easy to assemble. 1. Fantastic delivery: Ordered Friday, delivered Monday – Thanks. 2. As you can see from my pics, I have mounted the new aerial much more professionally this time, thanks to your site. I don’t like heights, and so did not mount on the chimney, it is too high for me/my ladders. along with the other analogue channels. 4. We use the Sutton Coldfield transmitter, which was on low power for most of last summer, due to the temporary antenna build. Power is now up again, except for two of the MUXes, although I can receive them all perfectly now. 5. I have an indoor aerial amplifier/distributor, which I may need to switch off after DSO, when the power shoots up, we’ll see. Justin, just a quick note of thanks for all your help and advice about my television aerial and of course to the lady I spoke to. You supplied me with a Yagi 18 for use on the Dover Transmitter which is at 82 degrees, 17miles from where I live. The aerial works perfectly and to be quite honest it is the best picture I have ever had! The previous aerial was a 'Gold' 52 Element (X beam “high gain” wideband) type only 6 months old and to be quite honest was a waste of money. When it rained, the picture went from viewable to black and white, snow storm then blank only to return when it dried out. The Balun was replaced but still it did the same. I had an aerial installer do a survey and he told me that he could fit another aerial but I would not be happy with it because of all the trees around me and tried to sell me a satellite system at £300+. However as other houses nearby had good pictures I was not convinced. I found your web site while looking for transmitter information and thought it was excellent and very informative and I was right! The build quality of the aerial is superb compared to the previous Aluminium foil one that was supplied, and it did everything you said it would. Thank you once again, an excellent service. my loft installed contract aerial. Not a surprise in hindsight. All the BBC channels received OK but channel 4, channel 5 and the obscure ones on say More4 or Dave kept breaking up. I naively then purchased a bacofoil SLX wideband aerial and, being very impressed with all the elements, replaced the old contract - subsequently finding the signal was even worse. So I now have a dryer loft and an excellent picture. The charts showing the gain of all the difference aerials was extremely useful in making me understand how inferior wideband and contract aerials can be. We`re in a poor signal area near Ashford and we had an Antiference XG10WB (a model of XB10WB) aerial up on Dover but we suffered from unacceptable digital picture breakup. The cable was satellite quality and the same downlead for used for both aerials. Swapping to a Yagi18CD resulted in the elimination of virtually all the break up, what more can you say ! These three reports (above) are particularly interesting because gain wise a decent XB10WB wouldn`t be that far behind a decent Yagi18CD (i.e. the one we sell), yet there was a significant reduction in picture breakup when the Yagi18C/D was used ! These aren`t the only occasions when a Yagi18C/D has outperformed a "high gain" wideband even when (theoretically) it shouldn`t. Most surprising was when a colleague of mine sold an 18C/D to a customer who had a TriBoom in his loft (on Winter Hill), I thought he`d be back on to swap it [or buy a mast head amp] but actually it worked better ! ? ! Not sure why exactly, maybe the grouped aerial(s) have a tighter polar response diagram ? But whatever it is, just like with any aerial install, nothing`s guaranteed because RF is a Black Art....... Anyway, even if the 18C/D doesn`t end up working much better than your XB10WB it will have a lower wind loading and be much better made, that, we can guarantee ! Replaced a wideband "high gain (XB10 type) Bacofoil" with your Yagi 18CD feeding a 24dB amp to an 8-way distribution amp to 5 TVs via Sky HD box. Originally analogue & digital from Dover were poor. The local area (Margate) is served by a 20w repeater for analogue. Much improved reception with the 18CD, although analogue at first suffered severe co-channel interference. Fitted a variable attenuator before the amp & eventually found a "quiet" channel on Sky's RF2. Happy with the end result, although the XB16E may have been a better choice. Roll on DSO! Very helpful & amusing website & a good sturdy product. My grandsons and I, all complete amateurs, erected this aerial on their garden cabin. It is 15ft from the ground and connected straight into a 5 year old Sony integrated Freeview TV. We pointed the aerial, using a small compass, towards our transmitter near Norwich and realised it was in direct line with our church 600 yards away and one of the tallest churches in Norfolk. The cabin is situated close to a overhead power line, close to a post holding a very large power box and is 4' below sea level. Our village is in a low reception area so our hopes of getting a reasonable picture were a little optimistic but when the TV was switched on and a setup scan completed we found perfect pictures and sound on all but one Freeview channel and no ghosting. My grandsons have learnt from this venture that it pays to buy good gear and take on board what the people who know their business tell you. Thank you for all your help and advice. What a great website - fun and informative. There is really no need to ask for any advice as it is all printed on this site. Using all the good advice here, I purchased a Yagi 18C/D which arrived the next day. Against the advice here, I have installed it in my loft and aligned it with Mendip transmitter using a pocket compass. Wow, what a difference to my old chimney-mounted antenna. No more digital drop-outs caused my my neighbour's Vespa and I can even get analogue channel 5 perfectly (out of group). We had a pretty decent system to start with as our original aerial was a Triax QR18WB (equivalent to a Yagi13WB) going through a mast head amp and satellite quality cable. It worked pretty well but there was still annoying freezing and blocking on some channels. I swapped to a Yagi18CD and whilst it isn`t perfect it is significantly better than it was. very impressed with the build quality of the aerial, in fact I`d never have thought there could be such a difference (in the strength of the elements) between different types of aerial. power being increased so much. Purchased a YAGI 18K to replace a 25 year old aerial (similar type but 10 element, probably an A group) located on a 10 foot pole on a chimney, on a neighbour's bungalow. Pointed at BILSDALE 118 degrees, used Wolfsbane to get this. The requirement was to improve digital performance only. 2) Installed the ATV Yagi18K, replaced the down lead, and the wall plate with a new MK unit, and the fly lead, - Leads were all CAI approved satellite cable (i.e. copper/copper). Build quality was fine no problems at all. Your additional instructions on the cable routing were useful, though I never intended to straighten the inclined dipole so those additional instructions weren`t quite so useful, but you must have all sorts as customers I suppose ! The web site is excellent, by far the best source of info on the web for this activity. In conjunction with the UK Free TV site. Loved the cowboy's pictures. Received the aerials on Friday, the day after placing the order online. Thanks for the excellent service. I spent sometime on the roof on Saturday trying the Yagi18C/D and the Log40. Using the signal strength/quality screen on my Pioneer TV as a signal meter, I compared the performance of the Yagi 18C/D and the Log40, and my old (came with the house) Philex XB5. We live in a low lying area which has no line of sight to the Mendip transmitter - it`s obscured by a big hill. With the old XB5 I was getting no signal at all on the COM4 Mux (at that time on reduced power from Mendip). With the Log40 I got quality of 100, average strength of around 50. With the Yagi18 I got 100% quality and average 60% strength. Hence the Yagi18 has stayed on the roof. I wanted use the Log40 as its so much smaller and hides nicely behind the chimney, but the extra signal strength from the Yagi is enough to mean it wins. Thanks again for your excellent advice and service, and for supplying what seems to be a very well put together aerial. We are on the borderline of good Freeview reception from Sutton Coldfield and certain digital channels have presented a problem in the past. When our old Triax Unix 52 wideband aerial blew down in a storm I contacted ATV: Justin recommended the Yagi18. I decided to go for a group E and the high quality coaxial cable. Now that the 18E has been installed all MUX's are noticeably stronger than with the old wideband UNIX 52 aerial, though MUX6 is still lower than the others *. To be fair we also changed the cable at the same time but all channels now have perfect reception with no picture break up even on the weaker channels. The 18E aerial is also very well made and seems very strong, the elements are certainly much stronger than the UNIX. Highly recommended. * Note that MUX6 (on CH55 pre switchover) was found to be a bit down on the other MUXES, even on an E group aerial [as opposed to a B group]. Bought the Yagi18E for use with Freeview (tuners on a Topfield 5800 pvr). Was getting a slightly iffy digital signal with a roof aerial pointing at Crystal Palace (had been fine on analogue) and as we have direct line of sight to Hannington (from an elevated position in south Reading) I thought I would try loft mounting a new aerial pointed at that. felt like I was fitting competent piece of kit. So a good result from using your info and kit - thanks ! Very good advice from a lady answering the phone and everything arrived when she said it would. The Yagi18K is pointing to Bilsdale seems fine on BT vision and our other TV's freeview box. Our picture is vastly improved and we now get all the channels we should. The old aerial pointed to Emley Moor(?) and we didn't get any BBC channels on the BT vision box and suffered other interference on other channels too. So far so good, thank you. I've just erected a Yagi18 E-band antenna to replace a wide-band high-gain antenna, which is directed at the Hannington transmitter. I live in a fringe area for TV reception (Crystal Palace transmitter is weaker) and have been getting poor signals on Freeview, so decided to upgrade to a more specific antenna. In the meantime, I discovered that the inline aerial amplifier was actually attenuating the signals, so disconnected it and discovered signals perfectly satisfactory without it! The 18E has a slight gain over the wideband antenna, but notice that signal quality is markedly improved. Hope this of use to you. "peep" above the houses opposite and get a better view of Winter Hill transmitter. enclose a couple of pictures for you and would be pleased if you could put them on your site to show what happens when you fit an aerial that you do not recommend. One is taken from ground level, the other through a window opening in my loft. I have been unable to find the missing pieces. Oh, and having just read your article on the lack of people complaining, may I just add that it would be a definite improvement to your site if you had a "search" box, like the majority of similar sites already have. I finally got round to adding a Google Custom Search box to the site in March 2013, though unfortunately it doesn`t allow ‘highlight searched for terms’ or “Jump To Text”, it only shows the page(s) that the searched for terms are on, which isn`t so much use if it`s a long page ! If anyone knows how to add either of these please get in touch. First we tried it on other transmitters, i.e. Crosspool and Belmont. Next we tried increasing/reducing the amplification of the amp [always buy a variable gain amp....] to more, then less, than optimum, but hey, we were struggling ! Next we swapped the Log40 for a Yagi18B. This improved things the most. We left site and waited with bated breath to see if the phone would ring. No telephone call was forthcoming. Eventually my sense of curiosity (and my impatience) got the better of me, so I phoned the customer. They replied that whilst it wasn`t perfect it was much better and they could cope with it OK. I said we may be able to improve it further with an XB16B (but that`d cost an extra £30, no labour, that`s just for the aerial ! ) and to contact us if they needed it doing. No call yet though ! Log Periodics should be used wherever possible, but they`re not universal ! to make up for what you`re losing in swapping from a Log. In this case it was a B group transmitter so we didn`t prat about with a wideband Yagi, we went for a high gain B group. Some feedback for you ref. my Yagi 18k. Thanks to your very informative website and much trawling of the net otherwise to ascertain transmitter frequencies, I was able to determine the appropriate aerial for my area in the Dordogne. It was reassuring that my findings matched the aerial previously fitted but which had suffered corrosion to the terminals and degradation of the plastic element connectors. It is apparent that the aerial is superior in respect to these points and in build quality generally. Anyway,suffice to say that after positioning the new aerial in preparation for fine tuning, when I turned on the TV lo and behold a perfect picture even with HD. I recently bought a Yagi 18K from you. As requested, here are details of my usage and findings. · Reason for Upgrade : Our 30 year-old contract aerial has coped reasonably well with digital switchover. Although we were unable to get some channels, I suspect that was down to frequency banding more than the age of the aerial. However, for other reasons we needed to move the TV to the other end of the living room, so it seemed a good time to change to a K-band aerial to get the other channels and to renew the cabling at the same time. · Performance : The Yagi 18K seems to perform well on digital. Not used on analogue, which is now switched off on our transmitter. · Transmitter : We live near Newmarket and are using it on Sandy Heath, which Wolfbane reckons is 32 miles away on a bearing of 253. · Comparison : I don’t have a professional signal strength meter. However the on-screen signal strength meter from my digibox shows approx 80% with the Yagi vs 60% with the old contract aerial on the channels we were able to receive before. In addition we are now able to receive more channels, presumably because of the Yagi’s wider response curve. Both aerials used with a signal booster (not a masthead amp). · Build quality looks better than the old aerial. Assembly was easy. I was most impressed by the speed of delivery of my recent purchase of a Yagi18E aerial. I placed the order on the 16th of November and received it on the 17th. Assembly of the aerial was straightforward and by the evening I was getting results from Sudbury digital 37 kilometres away with the aerial downstairs in the lounge. I chose the Yagi18E because my previous aerial (mounted outside at some 28ft) was a B group which did not provide adequate signals at the top of the band, channel 60/63 from Sudbury. The Yagi18E, installed on the 18th, provides good signals over the whole of teh Sudbury band. 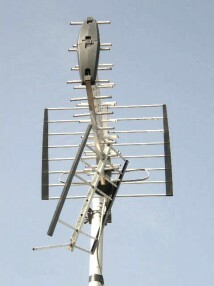 The Yagi18E is well designed and rugged - a Rolls Royce of an aerial, I would recommend it. I found your data on the various aerials most helpful in making my choice. We had a tri boom type aerial before but never had much joy with it, the signal quality on our TV only being about 5 out of 10. In fact as an experiment I compared it to an old 10 element wideband aerial, and even that worked a bit better than the tri boom*. I looked on UK Free TV and they said Caradon was a K group (since corrected by them to an A group) so I bought a Yagi18K and wired it up into my signal strength meter. Rather disappointingly it only lit one LED ! However when I plugged it into the TV it worked fine, the picture is much more reliable now. I can`t really explain that because both the tri boom and the Yagi18K are mounted in the same place and use the same cable (cheap signal meters aren`t worth having ! ). * That`s a bit strange actually. I`d expect a 10 element A group to work just as well (or even a bit better) than a wideband Tri Boom, but one of the latter should work at least as well or a bit better than a 10 element wideband, but then again, RF is a black art isn`t it ! Well ! An aerial is just an aerial right? – a bit of metal with stick like bits strapped on?? So why spend much time or for that matter money, right?? We just have to say – a Big, Big, thank you to ATV for a rich, all inclusive web site on aerial technology! – and for the excellent aerial you sent us. We live in a bungalow in Carlisle, served by a big stick mounted in the ground at Caldbeck. The Caldbeck transmitter is almost directly south from us, and we are in the far northern part of Carlisle. We are surrounded by tall houses, and have a tree line some 150 metres away, to the south with undulating terrain. We had great analogue reception, but then came the digital rubbish, which forced us to change aerial. I had bought the previous “Digital” aerials locally, the 1st fell apart in the wind, the second larger aerial was equally useless and not getting a strong signal but was at least a little stronger in construction terms. Finally, after another year or so, we had most digital channels working to an acceptable quality of 70%, but the Film 4 channel and ITV 4 were difficult with picture freeze and sound break up constantly occurring on a good day. More often they failed to materialise – just the usual message stating “no signal / service available”. Several other stations were also prone to glitches on sound and picture. So . . . after buying a meter to test the signal strength, which showed weak, we decided to do some more research before splashing out on yet another aerial. On-line, we came upon on the ATV web site and its stunning amount of information. We discovered that our Caldbeck transmitter was an “A” group transmitter. I done a mass of reading / studying on ATV and came across the “A” group aerials. We did look at the superstores after this, but found the aerials to be of weak construction in our opinion and basically the same price as or in fact costing more than ATV’s aerials in some cases! Many did not clearly state what “group” they were, but we eventually found that most were in fact wideband for "general use". Have to admit we hesitated at the ATV YAGI A18 because we were thinking it will just be the same as the others in build quality. Thank heavens we changed our minds at this point. Primarily because ATV clearly state which group each aerial belongs to, and secondly, because the aerial tech is so well explained, in my minds eye at least, that it demonstrated these guys/girls are passionate about what they do, but also know what they are doing! So . . . anyone thinking of buying this particular aerial? We can confirm and advise you that this Yagi18A makes all other aerials look like cheap, tacky TOYS! The Build Quality of ATV’s Yagi A18 is gob smackingly solid. The wing nuts! clamp! and other components are SOLID Quality. This aerial will never break up, bend or rust in our sincere opinion. Signal Quality / Strength : the Yagi A18 is pure muscle when it comes to getting a signal. My meter is just a basic 5 led Signal meter that only showed a single faint green led glow when I tried it on the old aerial in the front room. Plugged into this new aerial and all leds came on so very strongly that we almost felt like the meter was going to blow the leds out of their sockets! What about Quality? Can we get Film 4 and ITV 4 ? A resounding yes and what a difference to see a film on these channels that no longer stutters and splutters. No ghosting or any other apparitions have appeared on those two channels and as for the rest of the channels? – all brilliant! It may have cost slightly more for this aerial, but well worth the extra pennies. Thank you again ATV, for such a brilliant Aerial which arrived within 48 hours of ordering, and thank you for such an excellent web site that is full of confidence building information. I had an aerial in the loft but it didn't work too well so bought a Yagi18B and installed it outside on the chimney using one of your 6 foot cranked poles, an 8 inch mitre bracket and a lash kit, plus recabled in your good quality satellite cable. I also fitted a folded dipole FM aerial at the same time, I went for the this aerial rather than the half wave dipole because we live in a pretty exposed location. The Yagi 18B worked pretty well though some of the programmes do still intermittently break up. It is far better than the old aerial though obviously that was in the loft so at a bit of a disadvantage. I note your advice to try a mast head amp in an effort to further improve the signal but to be frank we don`t watch much TV so can cope with it how it is! Unfortunately just the other week we had a 110 mph gale up here in Orkney which cracked the pole on the bend so it now needs replacing. Interestingly the pole had survived gusts of similar speed before but this gale did last about an hour! After all this extreme weather the only thing wrong with the aerial is one of the directors has developed a bit of a rattle but I'll tighten up the screw when I get round to it. I've decided to fit the aerial on the wall this time because the high winds have caused the corner pieces of the lashing kit to start to digging into the masonry on the corners of the stack, the actual chimney bracket was fine. I`m also going to use your 5 foot long inch and a half diameter pole satellite pole and not one but two 6 inch by 9 inch wall brackets, it shouldn't ever fail then! As a bit of a footnote, when the installation got blow down the wind blew the aerials (by now hanging off by the cable) against the wall for a while and the dipole cover of the FM aerial was worn through. I feared that would mean a new aerial but fortunately I`d bought it from ATV and they sent me a spare one! So thanks for that, and also thanks for offering to supply the replacement mast free and for writing the only aerial website which actually made sense. If any pole we sell fails in use (provided it`s used as we recommend) just send us a pic of the errant install and we`ll replace the pole free (though you will have to pay the carriage). Despite George`s experience I`d still recommend one of our 6ft x 1.25in cranks for a Yagi18, in fact, from memory, we`ve never had one fail on any install we`ve ever done. Actually that`s wrong, after high winds we once had a 6ft crank split open longitudinally on the bend, it was very odd, I`d never seen it before (or since). I think in George`s case the prolonged extreme Orkney wind combined with the additional wind loading of the Folded Dipole (higher wind loading than a Half Wave don`t forget) was too much for the pole. As of May 2013 we`ve extended the lifetime warranty to any bracket we sell. Again it has to be used as per our recommendations but if any bracket we sell fails send us a picture of the failed installation and we`ll replace the bracket free (excluding the carriage cost). It`s good to hear just how robust the Yagi18s are, I`ve always thought they were well made but 110mph ! Incidentally, as George says, if the elements on a Yagi18 (or a DM Log come to that) do become loose [which I have to say is a rare event] you don`t have to scrap the aerial, just tighten up the screw. If the screw won`t tighten because the thread is stripped just put a slightly bigger gauge screw in, that usually sorts it ! We do try to supply spares for aerials purchased from us, which happily helped George here ! it`s snapped a 1.25 inch 16G pole ! Thanks for all your help with my new installation, it's working great, very pleased. We live in a valley with no line of sight to Emley Moor which is some 20 miles away. Previously I had a Maxview XB5 type aerial from the local DIY store mounted on a 6ft pole with satellite grade alloy foil type cable (about 12m) in good condition. Running one set reception wasn't great and we had quite a lot of picture break up due to lots of trees in the way. We could only pick up the local relay transmitter at Todmorden which doesn't have all the channels on it. There was no signal from Emley Moor even after switchover. I've now fitted a Yagi18B, a 10ft 2" mast, a single output masthead amp and a four way splitter. The Yagi18B blows the old aerial clean out of the water, signal strength is very good, we only needed the masthead amp because of the four points in the house. We have just finished a house refurb in Micheldever. The original 16-element contract aerial (with wobbly reflector) was mounted on a 10ft pole on the chimney, and worked quite well, but after the refurb we no longer have a chimney and using the same length pole on a gable end lose about 6ft aerial height. Though only 9 miles from Hannington, we are at the bottom of a hill with surrounding trees and have a bungalow so looking at the great info in your site, a Yagi 18B seemed appropriate. I purchased from ATV the Yagi, a 1/2 wave VHF dipole, some 18" T/K brackets, the 6-way distribution amplifier, a reel of coax, two diplexer faceplates and some sundry items. I mounted the aerials on a 10ft pole on a gable end. The quality of the aerials are good, and the faceplates are particularly good quality. Assembly and fitting was easy. Location: Small village near Cambridge. The Transmitter for much of Cambs and Beds area is Sandy Heath, Bedfordshire. According to Atv-website, Sandy Heath analogue signal aerial was an A-band, but after digital switch over optimum aerial should have been K-band. Bought a new 32" Samsung Flat Screen HD Tv last month with built-in Tv Tuner to replace >15 yr old 24" Sony Trinton CRT Tv with Hitachi Freeview set-top box. The old Tv always suffered from random pixelation after Digital Switch Over, but with the new larger screen Tv, the wife increasingly complained about the random pixelation, so action had to be taken ("at last", she said !). New : Atv-supplied 18-element Yagi 18K aerial situated on nearside of house (access via neighbours property) newly cabled with Atv-supplied satellite-quality tv cable. Cable length is now a bit shorter at approx 15m and with no wall plate socket. The signal reading on the new Samsung Tv, the in-built menu signal quality display showed 93->94 percent signal strength, and always 0 (zero) signal bit errors for the New Aerial. The Pro Tv Signal Finder showed a 70 dBuV reading at the plug (no wall plate). So the meter showed a relative +18 dBuV signal increase Old Aerial->New Aerial signals. No visible pixelation now seen. Wife happy. Job done. Congratulations to Atv on a most informative website. Good comprehensive aerial kit supplied; all parts seemed to be of good quality. Obviously the most important observation by far in the above report is "wife happy". We don`t usually recommend the purchase of signal meters, we don`t think they`re really required for aligning your aerial and so for most people they`re a bit of a waste of money. However in this particular case it does at least mean we`ve got an second set of readings over and above the TV`s ! A Yagi18K will outperform pretty much any wideband (and it`s better made then any of them.....) but an 18dB increase in signal is huge and cannot really be explained by just the aerial. The wall plate wasn`t isolated so is unlikely to be the problem, so that just leaves the cable, or aerial positioning. Moved into a new house, TV point didn’t work. Turned out the initial cause was lack of a power supply for the amplifier on the aerial. TV man came out (at hideous expense, considering), replaced it, then went away with the pictures on many channels marginal. Being a bit of a dabbler, and the roofer having left a roof ladder handy, I investigated further. Found the aerial amplifier wasn’t sealed and was very rusty inside, replaced it. Routed the aerial cable to where we actually wanted it (cutting out around 5m of cable and 10m of extension as a result). Still not a great picture on some channels, in particular MUXES 55 and 57, found this site. Realised the fitted one was cheap tiny rubbish (X5WB? ), and looking at the frequency response of a Yagi 18C/D it looked like it was best where the signal was weakest. So, ordered one and fitted it. Sadly and oddly found that whilst most of the bad channels were now good, the good channels were now bad, and in the case of MUX 3 on CH60 (HD channels) non existent! Got in touch, and found that I’d misread part of the instructions, resulting in my fitting the aerial cradle in line with the elements, rather than at 90 degrees to them. Once it was put at 90 degrees to them, all the channels came back in good quality. The ‘incorrectly fitted cradle tests’ on this site don’t go above CH52, but show the largest drop in signal at this, from my experience I suspect that the drop in signal increases further at higher channels. Still, their conclusion (fit it at 90 degrees to the elements) stands firm ! The one thing I do regret doing is not checking out the local area first, however. Looking around other local houses I now see that they point to one of three transmitters. Crunching the numbers on various websites I’d have probably done better getting a Yagi 18K and pointing it in the opposite direction at Bromsgrove. I suspect installers just try one direction rather than seeing which is best for an individual house. I also see lots of houses with multiple aerials and satellite dishes, probably people who replaced the system rather than improving the aerial ! We`re grateful to Chris for supplying this aerial report which not only backs up my tests but will hopefully act as a warning to others ! I've read your website but have confused myself. Please could you recommend me an aerial for my static caravan at Monkton. I currently have a V10-28L Log Periodic aerial made by Vision securely mounted approx 4 metres above the ground which connects directly into the back of a Samsung LCD TV using approx 8 metres of CT100 cable. It points to the Dover transmitter. The inbuilt TV tuner says I get roughly 92% signal strength and no BIT errors but intermittently it dips for a second or two to almost 0% signal and 2000 BIT errors (this is despite the fact the Digital UK postcode checker says it`s a good signal area). I'm absolutely sure that I have good connections and have eliminated thermostats/fridges and other devices. I can only think this is being caused by a row of very tall conifer trees about 150 metres away that is directly in the path of the Dover transmitter. Am I stuck with this or can I improve things with a higher gain aerial? Well I bought a Yagi 18E from you and I'm pleased to say it's done the trick. Just thought I'd let you know in case it may help others. Many thanks for your help. Just need somebody to volunteer to take the old aerial down... probably a cat lover..